Egypt’s Constitutional Referendum: Did President Morsi Hijack Democracy? President Morsi created a new constitution for Egypt on December 26, 2012. Prior to this, Morsi was forced by massive street protests in Egypt to rescind an executive decree that granted him sweeping presidential powers. His opponents called it an empty gesture as Morsi’s government rolled out the tanks and brought out the Egyptian military from their barracks into the streets. Opponents of Morsi and the Egyptian branch of the Muslim Brotherhood accused him and his Freedom and Justice Party of playing a game to stupefy Egyptians by consistently making propositions, then withdrawing them, and then making them again to create confusion. After calling out the military, Morsi’s government would then rush a constitutional referendum forward that would guarantee him more powers. The constitutional changes in Egypt have divided its society. Several Muslim Brotherhood offices have even been stormed by large groups of angry protesters. In what appeared to be a turning back of the clock to the Mubarak regime’s use of brute force, reports of casualties caused by attacks on protesters and activists were far spread. Morsi’s supporters and Egyptian security forces would fight in the streets across Egypt with those opposing the new constitution. A peaceful sit-in of activists in front of the presidential palace in Cairo even ended in violence and death as fighting broke out. The new constitution won by a 63.8% approval of yes. This is very misleading when the level of participation is used to generate further data. Only 32.9% of eligible voters cast their ballots for the election and most importantly the new constitution was approved with the support of 20.9% of eligible voters. Only 17.1 million people out of nearly 52 million registered eligible voters in Egypt participated. 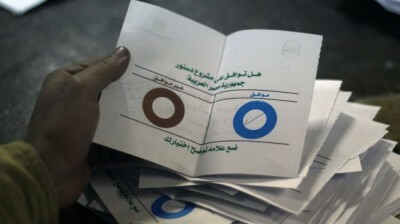 Even though the Muslim Brotherhood and its political allies came out in full force to vote, the turnout for the referendum was actually low. This means that about 35 million eligible Egyptians (1) did not bother to vote or (2) boycotted the referendum or (3) were unable to go to a polling station to vote. In some countries such a turnout would be disqualified, because of the lack of citizen participation. Demographically, only 10.9 million Egyptians voted yes to approve the new constitution. This is not even a quarter of the population in a country of nearly 82 million people. This means that about 13.3% of the Egyptian population supported the new constitution. The numbers or data speak for themselves. Interpreting these statistics, we have a sound frame of reference to categorically state that a minority of Egyptians helped secure the Muslim Brotherhood’s new constitutional. It is little wonder that many Egyptians declared that the referendum was illegitimate. More Political Turbulence to Come? The leadership of the Muslim Brotherhood is being perceived more and more by Egyptian society as a corrupt organization. It has flip-flopped on many of its promises. Even ideologically the group is being perceived as corrupt by many Muslims inside Egypt. Large segments of Egyptian society believe that very little has changed in their country. For Morsi’s opponent the status quo of the Mubarak era in Egypt essentially remains intact under him and his Freedom and Justice Party. Like the dictatorship of Mubarak, the Muslim Brotherhood has refused to fully open the borders with Gaza to help the Palestinians. Its calls of support for the Palestinians have proved to only be political lip service. In fact, like Mubarak, the Muslim Brotherhood immediately pledged to safeguard Egypt’s peace treaty with Israel when the doors of power were opened to them. Finally, Morsi’s US-supported and Israeli friendly truce between Hamas and Tel Aviv appears to be a strategy devised to de-link Hamas and the Palestinians from Iran and the Resistance Bloc. Morsi and the Muslim Brotherhood have kept all the employees of the Egyptian Foreign Ministry from the Sadat and Mubarak eras in place. The structures of Egypt’s intelligence services have remained untouched and are intact. The Muslim Brotherhood has continued to subordinate their country’s economy to the International Monetary Fund (IMF) like Mubarak did; this is in opposition to the tenets of Islam that ban interest-based banking. Morsi’s attempts to viciously repress Egyptian protesters with force also resemble the use of force from the Sadat and Mubarak eras. The violent crackdowns on Egyptian protests by the Muslim Brotherhood have resulted in many protesters saying that the new government is just as murderous as the last. Political instability and turbulence lies ahead for Egypt and the Muslim Brotherhood. The country’s economy is not doing any better and a new parliamentary election, which is scheduled for the end of February 2013, will see more heated battles between the Muslim Brotherhood and its opponents as the country is further galvanized. 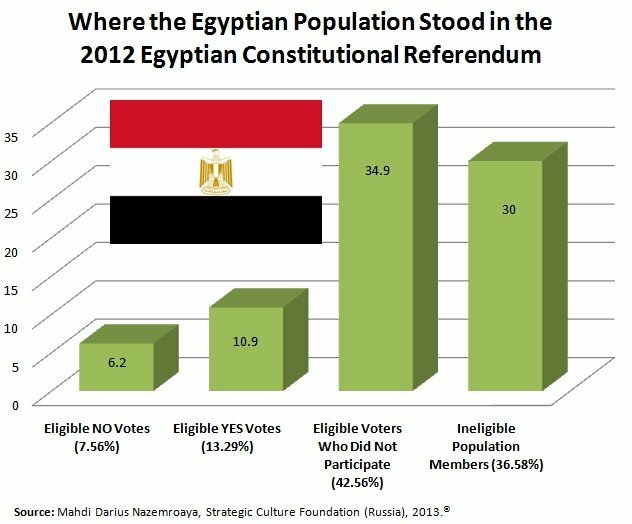 Although determining the exact reasons is a different research topic, it can categorically be stated on the basis of the referendum’s numbers that Morsi’s constitution does not have the support of the majority of Egyptians. The votes of approval that were cast were unrepresentative of most Egyptian society. Is this democracy? It is here that one can see the flaws in voting procedures that emerge in so-called “democratic processes.” To be candid, a country or society cannot be considered democratic just because voting takes place. This is not democracy, but a “motion of democracy.” In paradox, democracy has continuously been hijacked through the ballot box and under seemingly democratic mechanisms or motions. Egypt is not the only case. Other countries, like the US and Canada, face similar problems where minorities are making decisions for the majority of the population under the guise of democracy. Democracy is not about voting per se, it is about active participation and collective decision making by all the members of a society. This is called “direct democracy.” Anything else is not real or authentic democracy. Voting in larger societies has been presented as a substitute representing an individual citizen’s voice in charting the course of their society under what is called “indirect democracy.” Indirect democracies are preferably referred to as “representative democracies” to conceal or gloss over the fact that they are not direct democracies. These calculations were made by the author for the Chinese press right after the Egyptian constitutional referendum and based on the Arab Republic of Egypt’s Central Agency for Public Mobilization and Statistics official population figure for 2012 and two pieces of numerical information or data about the referendum provided by the Associated Press (AP) on December 25, 2012. The data from AP is the following: (1) 63.8% of voters said yes; and (2) 32.9% of nearly 52 million registered voters went to referendum polling stations. It should also be noted that the data provided are estimates and that among the non-eligible members of the Egyptian population there are those that are under age. According to the Central Agency for Public Mobilization and Statistics, the Egyptian population is 83,774,037 as of January 18, 2013.